Over the years Zandvoort has grown into an extremely popular kitesurfing location. 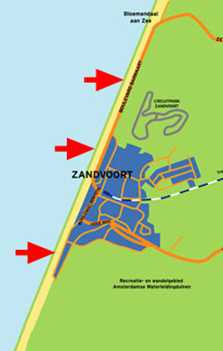 Kitesurfing is possible in Zandvoort because of the wind direction clockwise from SSW till NNW 210 through to 020 degrees on the compass and there are several kitesurfing zones where the sport can be practised. On windy days it can be fairly easy to reach the beach by train or by car because the beach is not busy with tourists. However, when there is a warm, sunny forecast particularly in the months of June, July, August or September, there can be a lot of traffic! On such sunny days when there is also very little wind, it is possible to find the kite zones closed. So you would not be able to go kitesurfing anyway. Better to check! At this established kitesurfing centre, it’s possible to get your kitesurfing lessons from a professional. There are various courses and they can also fix you up with a complete package of kitesurfing equipment. Kitezone is one of the best places in Zandvoort to get started in this exciting and stimulating sport. This is the most central kite zone and often the most crowded one. It is quite close to the railway station so is a good place to start or end a down winder if you have travelled to Zandvoort using public transport. Special Note: During public holidays it can be dangerously crowded. The most southerly kite zone in Zandvoort is in fact the easiest to reach by car. When it is windy there is nearly always someone around in the area who will help you with landing and launching. It is also a more quiet location. Car parking is available at “De Zuid” where you can park for a few Euros per day. To guarantee a successful kitesurfing session you must keep a close eye on the tide. The tide influences the current and if the current is against you, it will give you a hard time. The current moves north on the incoming tide and moves south on the outgoing tide. The wind and wave directions also influence the current. It is best to go when the tide is high or low, depending on the wind direction. Wind and tide must go in opposite directions. So when the wind blows from the north you want the current going north and it’s best to start with low tide. When the wind is blowing from the south you want to start with high tide because the current will be moving south.